Android 7.0 Nougat is nearly here. 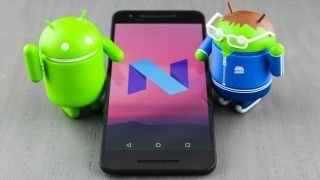 We know plenty about the upcoming Android 7.0 Nougat - you can even run it today if you're brave enough to try a developer preview - but we don't yet have a fixed date for when the mobile OS will start rolling out. Now seasoned phone tipster Evan Blass (@evleaks) has promised Android 7.0 will be with us sometime in August. That's only slightly more precise than Google's own estimate of "summer" but we'll take it anyway. Of course it doesn't give much clue for when your specific phone model will get some Nougat goodness - presumably the current Nexus phones are going to be first in line, although Blass says the 2013 Nexus 5 won't be upgraded by Google. If you're rocking something made by Samsung, LG, HTC, Sony or any of the other Android manufacturers then you're probably looking at a wait of several months or more to get Nougat. We'll update you as and when we hear news. Indeed just 13.3 percent of phones in use today are running the latest Android 6.0 Marshmallow software, not a pretty picture from Google's perspective. Phones running Lollipop 5.0 and 5.1 remain the most common with a 35.1 percent share. We are expecting a couple of new Nexus phones in September or October and they're probably your best bet for getting Nougat as early as possible if you don't already have a Google-branded handset.